Brazilian Jiu Jitsu history is unique in that it is one of the only martial arts that traces its lineage back to a single family. In 1801 a Scottish immigrant by the name of George Gracie moved to the state of Para in northeastern Brazil. There he and his family lived for many years. In the early 1900s a Japanese man named Mitsuyo Maeda moved to the same area. The Japanese government was eager to form a colony in Brazil, and Maeda was there to help the colony prosper. In addition to his political skills, Maeda happened to be a former champion in the Japanese art of Jiu-Jitsu, and he began teaching lessons in Brazil, hoping to pass on the tradition. He became close friends with Gastão Gracie, the grandson of George Gracie. Gastao was a political figure in the State and used his influence to help Maeda and the Japanese colony. Maeda in return for the help offered to teach Gastão’s son Carlos the art of Jiu-Jitsu in return for all the help from Gastao. In 1925, after moving to Rio de Janeiro, Carlos and his brothers opened the first Academy of Gracie Jiu-Jitsu, in the Flamengo area of the city. At the time, Rio de Janeiro was the capital of Brazil. The academy quickly became an enormous success and soon the brothers were teaching the top politicians and personalities of the country. The Gracie Academy had many instructors teaching classes all day long. What they taught, at first, was the traditional Japanese style of Jiu-Jitsu Carlos had learned from Maeda. Like judo, it was a grappling style of combat with many formal rules. Weighted down under centuries of ritualized tradition and technique, there was little room for innovation. But, half a world away from Japan’s influence, the sport found room to breathe in Brazil. Carlos and his brothers knew little of formal martial arts, and were thus able to simply discover what works best in any given situation. Free to emphasize what was effective and leave behind anything that didn’t serve a purpose, the sport quickly evolved from its parent sport into something quite different, and came to be known as Gracie Jiu-Jitsu. Highly influential in the development of Gracie Jiu-Jitsu was Helio Gracie, Carlos’s younger brother. All the Gracies were slight of frame, but Helio was particularly small and frail. He even suffered from spells of dizziness that prevented him from attending school. Young Helio would spend his days watching the others teach all day long. He observed more closely than anyone realized, because one day when Carlos was unable to make it to a private class, Helio offered to teach the student. Helio was sixteen years old and weighed 140 pounds, and the student was skeptical but agreed. At the end of the lesson the student was so impressed with Helio’s teaching style that he asked Carlos if Helio could be his teacher. From that day on Helio Gracie became a full instructor at the academy. Over the next few years, Carlos and Helio developed a new style, called Gracie Jiu-Jitsu or Brazilian Jiu-Jitsu. Because of his small stature and frailty, Helio could not use many of the Japanese moves that were based on power and speed, so he developed new leverages and new ways of doing moves. As Helio tells it, “My brother Carlos was very athletic, quick and flexible. He could do those moves no problem, but myself, I was a sickly young kid and couldn’t use the same leverage points or the same speed, so I had to adapt.” With Helio doing more of the instructional work, Carlos was able to dedicate himself to the managerial side of the family business and to developing the famed “Gracie Diet.” (a diet based on food groups and how they combine with each other, it has been developed, perfected and used by the family for the last 75 years) Helio turned out to be a brilliant innovator, and the style he developed proved to be victorious against all others, regardless of size. 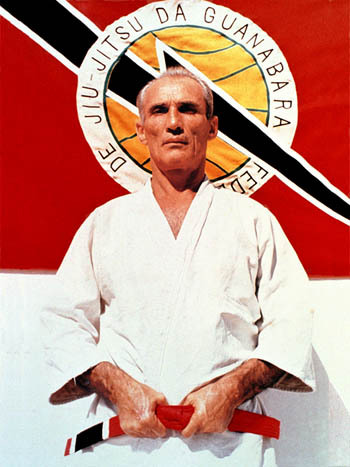 Helio Gracie became the top sports figure in Brazil in the 1930s. Fighting in public events in front tens of thousands of spectators, his reputation grew immensely. For over two decades the Gracies accepted many challenges and fought a variety of opponents from different backgrounds and of different sizes. In one extreme example, brother Osvaldo Gracie, who weighed 140 pounds, fought John Baldy, who tipped the scales at 360 pounds. Osvaldo defeated Baldy with a choke hold in just two minutes. Eventually the Gracies’ fame reached outside the borders of their homeland, back to Japan, home of the most skilled martial artists in the world at that time. The Gracie brothers issued a challenge to the best martial artist Japan had ever produced, Masahiko Kimura. Kimura stipulated that he would not fight Helio until Helio had proved himself against the second-ranked fighter in the world at that time, known as Kato. Kato was forty pounds heavier than Helio and considered by many to be the best Jiu-Jitsu technician in the world. The two fought a legendary battle to a draw. In the rematch, Helio choked Kato unconscious with his favorite move, the front lapel choke. Master Kimura then challenged Helio to a fight. Kimura stated at the time that if anyone so slight could survive three minutes in the ring with him, he would consider it a defeat. Helio, despite the huge weight difference and strength difference, battled valiantly for thirteen minutes before he was caught in a brilliant arm lock called “the Kimura”—now a standard move in Brazilian Jiu-Jitsu. Seeing his brother’s arm about to be broken, Carlos threw in the towel.For the next seventy-five years the Gracie family dedicated itself to the preservation and dissemination of this great fighting style—once called Gracie Jiu-Jitsu, now more widely known now as Brazilian Jiu-Jitsu. In the past years, the newest generation of Gracies have brought a popularity to the sport beyond the wildest dreams of Carlos and Helio.